Need Advice? Ask This Flower Girl! She Tells Her Dad EVERYTHING About Weddings! When we were kids, we knew everything! Mom and dad were just too old to understand, and we didn’t have anything left to learn! I remember that brief stage, but thankfully my parents didn’t have a way to record any of my “lectures!” I’m glad dad took out his phone, this little lesson is a gem! She’s old enough to know that a wedding is a serious ordeal, but not old enough to remember that her dad had his own wedding, too! It’s just too cute. She is really confident that she knows everything that there is to know! She is taking her job as the flower girl very seriously. This is the most important day of everyone’s life! 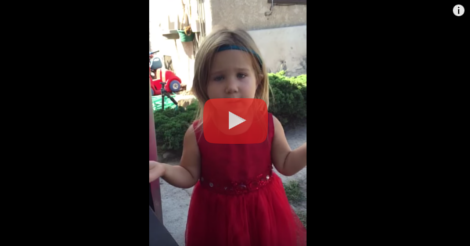 The cutest part of this video is when she starts using her hands to tell dad what he isn’t allowed to do! “You can’t call my name!” Obviously, dad doesn’t understand weddings. AT ALL! I hope they play this video at her rehearsal dinner in about 20 years! It would be too cute! Too often my kids say the silliest things, but I don’t think to grab my phone and start recording them until I’m telling my husband later that day. I wonder how many adorable monologues I’ve missed by forgetting that my phone doubles as a camera?